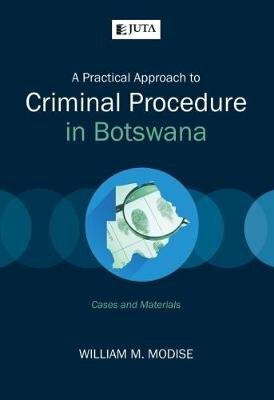 A Practical approach to Criminal Procedure in Botswana explains the basic principles of the law of criminal procedure in Botswana in plain and concise language. Aspects of the law of criminal procedure are analysed with an emphasis on their practical application, and with reference to recent case law and legislation. The author also discusses the rights of the accused at each stage of the criminal justice process. A Practical approach to Criminal Procedure in Botswana provides comprehensive, analytical and up-to-date information for judicial officers, legal practitioners, law students, academics, law enforcement officers, researchers, paralegals and those involved in the administration of justice.